Ouch! 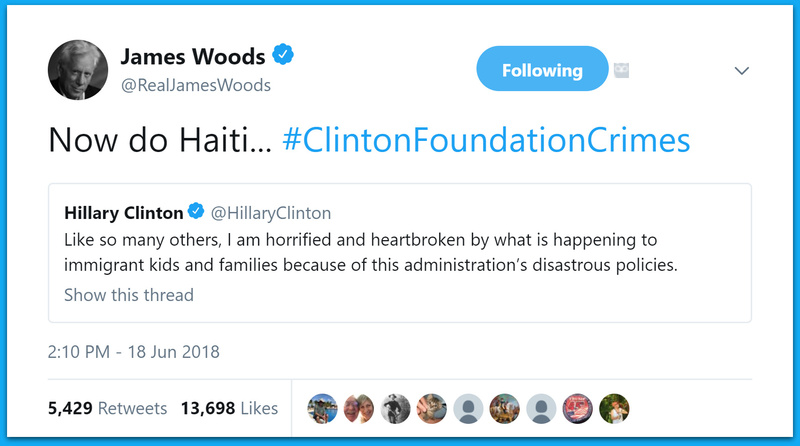 This is why we love James Woods so much! The liberals don’t care about those kids. The MSM got their marching orders to scream about ripping children from their mothers in order to distract people from the IG’s report and the hearings that are currently taking place. Next week they will be screaming about something new. Hillary unleashed a Twitter rant Monday showing faux outrage over an immigration policy that separates illegal alien children from their ‘parents’ at the border. TGP: Hillary Clinton has no room to talk; she should sit this one out. Hillary Clinton tweeted: Like so many others, I am horrified and heartbroken by what is happening to immigrant kids and families because of this administration’s disastrous policies. James Woods had the perfect response and moved in with a kill shot.